Seven years after ‘La Saveur du Songrong’, the fourteenth Jonathan album is published. The story of ‘ELLE’ is told by Jonathan himself – it is told by various citations from his journal. Jonathan has started writing in his journal while he is waiting for the recovery of a doctor friend who is suffering from an appendicitis. 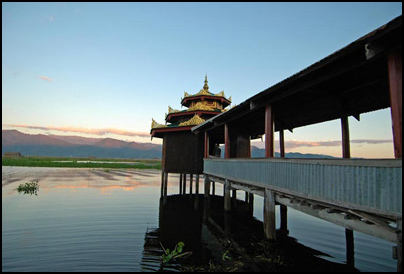 Philosophical questions and remarks, accounts of his travel from China to Burma (and from Rangoon to Lake Inle), citations from letters, make up a large part of the story. The ‘plot’ itself is quickly told: Jonathan is ‘used’ by Burmese political activists (of whom the most important are the monk U Kyi and the ‘giraffe woman’ Sabei) as a messenger (because he has a laptop computer from his doctor friend) to report on the human sufferings of the Burmese people. The ‘action’ starts more than halfway of the album – it clearly is not the essential part of the album. The essential part of the album is the philosophical questions Jonathan (and Cosey, as we will see) is trying to answer. To me, it seems this question is about ‘the experience of reality’. For his entire career as an artist, Cosey has had a preoccupation with reality. Cosey travels to places that come back in albums, Cosey meets people who appear in the albums as characters. In many interviews (and in Echo), Cosey stresses the importance of ‘reality’ in his albums – it gives a story a foundation, a depth or relief a credibility. Cosey has used ‘reality’ in a documentary way to give his stories a shape, a form. In ‘ELLE’, Cosey asks (via Jonathan) questions about the nature of reality itself. The questions and remarks written down by Jonathan are a play with questions about reality and interpretation. He asks questions about speed of observation or sense, about the great human thinking machine we all are (that interprets the things we observe and creates new realities), about imagination that can be felt as strong as reality itself, about meditation and the experience of a pure ‘here and now’… An essential remark is made by Jonathan at the moment of the surprise appearance of Sabei: ‘I like that short moment in which we observe a situation clearly, the fraction of a second that precedes our reaction of fier of joy’. Jonathan wants to experience this moment of ‘neutral’ observation, of pure reality before our thinking machine starts to interpret and distort reality. Meditation must be the key to this experience of reality, but one feels that so far it is a unattainable objective for Jonathan. I think that in this longing for a neutral, objective observation of reality, Jonathan and Cosey are closer than ever before. In several interviews (as well as in ‘Echo’) Cosey, tells about the joy of pure drawing: model sketches, sketches on location: ‘For me, sketches are often suprior to the final results (i.e. the finished images in a comic album) (…) I think that while you are making a sketch, one forgets himself (…) A sketch is made without afterthought, without control. It is a step towards a goal. But when you are at the last stage, one is conscious that, while drawing your line, it is really going to be printed. There is a sort of stiffness, one looses a little of spontaneity.’ (From an interview of Swissinfo in 2007). Again, the contrast of a ‘neutral observation’ and a conscious, interpretive creation. The philosophical dilemma of the artist! The fragmented way of telling the story (a Cosey hallmark) and the intermingling of philosophy and plot result in an album that requires a serious effort of the reader… and a few readings to be conquered! Another subject in ELLE is the contrast between religion/spirituality and pragmatism. 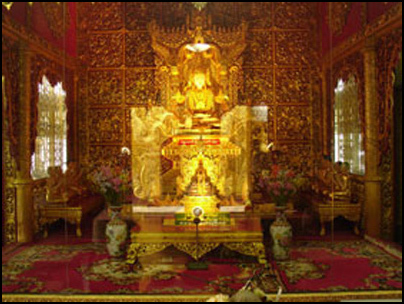 Jonathan takes the religious teaching of U Kyi much more seriously as U Kyi himself. In fact, U Kyi makes up a story about the ‘special way’ just to use Jonathan for more earthly purposes (of course, the purpose in itself is good and noble). In a way, U Kyi puts the daily reality before his religious/spiritual principles (see also the joke about having to pay for it in his next life). In ‘Le Bouddha d’Azur’ you have seen this same abandoning of certain religious ideas for more earthly ‘pleasures’, when Lhahl gives up her predestined life (being reincarnated as the fifth Lhahl) as a religious leader to live with Porridge. Both ‘ELLE’ and ‘Bouddha d’Azur’ show a pragmatic attitude of two (oriental) religious ‘leaders’ (U Kyi and Lhal), that surprises two occidental figures (Porridge and Jonathan). 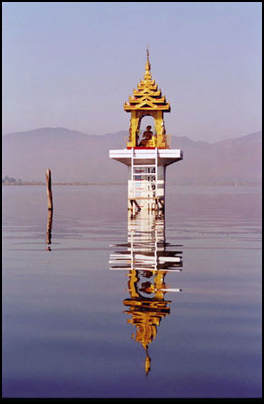 The story of ‘ELLE ou Dix mille Lucioles’ is set in Burma, more precisely at the Lake Inle in the center of the country. 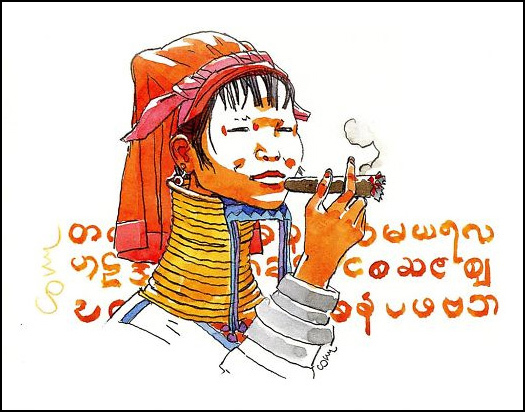 Cosey visited Burma twice: in 1989 together with a friend photographer and, more recently, in january 2007 as a member of the expo ‘Comics Country Switzerland’. 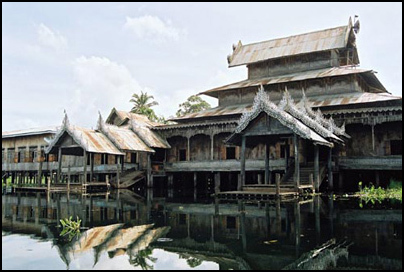 Cosey was impressed by the beauty and religiosity of Burma, and revolted by the military regime. In an interview with Thierry Lemaire (read the full interview on his blogVoyage au centre de la BD), Cosey says: ‘I wanted to tell about the mysteries one can feel, this mystical atmosphere, all this while mentioning the oppression that the people suffer since 20 years. 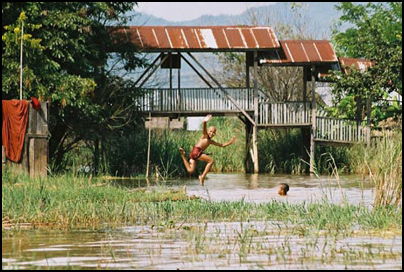 And you have this magical life on the lake’. One earlier album of Cosey is set (partly) in Burma: ‘Zeke raconte des histoires’, published in 1999. The fourteenth Jonathan album appears seven years after number 13. 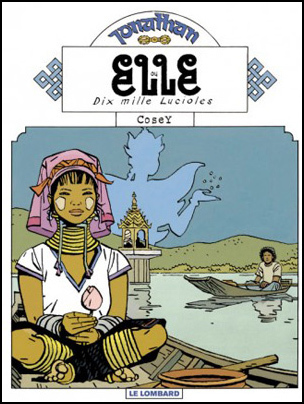 Since Jonathan 13, Cosey made two ‘real’ comics, ‘Une maison de Frank L. Wright’ and ‘Le Bouddha d’Azur’, as well as the ‘lesser’ comic ‘Champéry, été 1863’ and the beautiful art book ‘Echo’. The break of seven years is not the first ‘interruption’ of the series. Between Jonathan 11 and 12 we had to wait for 12 (!) years. And between the albums 12 and 13, which can be regarded as two parts of a story, Cosey published ‘Zeke raconte des histoires’.